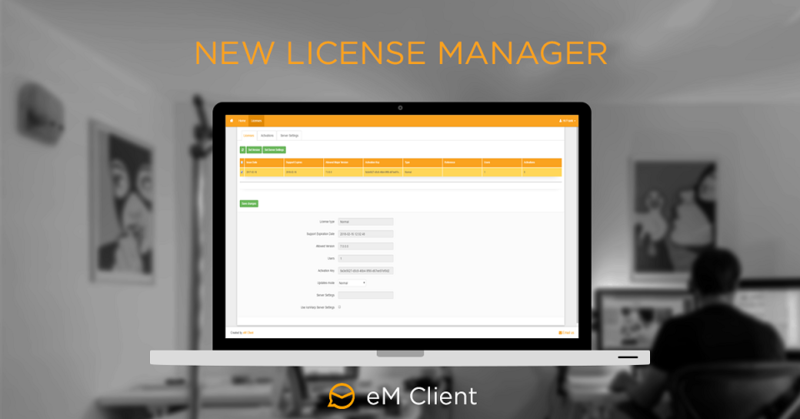 eM Client License Manager is a tool for managing licenses and settings for eM Client Pro customers. It enables you to remotely deactivate old unused licenses as well as configure server settings like updates and signatures for your entire company. As you might have noticed, our old License Manager ran on Silverlight. The problem with Silverlight was the fact that no modern browser really supported it anymore and as a result, pretty much the only way you could access it was through Internet Explorer. Which brings us to our next question - which web browser is your favorite? Do you, like almost 60 % of the world, like Chrome and its speed and simplicity? Do you prefer the customizability of Firefox? Or perhaps you ride the cutting Edge of Microsoft? We recognize that not that many people use Internet Explorer anymore these days and finally after a long period of development, we brought 2017 to our License Manager. No longer will you be required to install Silverlight or be locked to Internet Explorer. You can now access the new License Manager on ALL browsers. Period. The layout and controls stay the same, so you won’t have to re-learn everything you already know about the License Manager, only now it’s lightning fast and way prettier, keeping in with our design philosophy in eM Client 7. It’s live already, so go to licensemanager.emclient.com and try it out for yourself!